Sunshine village is a ski resort located near Banff, Alberta, Canada. Set in the spectacular heart of the Canadian Rockies in Banff National Park. It’s around eight kilometres west of the town of Banff and an hour and a half west of Calgary. In our visit we stayed in the Town of Banff and caught the shuttle bus to the ski resort which came as part of the ski pass we purchased. Depending on how many stops the bus makes the journey can take between 20 – 30 minutes but with spectacular views in all directions and a large spacious bus the time will fly by. However if you have a car you can drive up to the resort in no time and park in the large car parking lot. Once you arrive you can jump on the main lift at Gondola Base and head straight up the mountain. Sunshine village has a ski area of 3,358 acres and around 107 named runs with the longest one available on a good day being around 5km. There are plenty of options to cut through tree sections and make your own routes between runs. There are 12 lifts currently (2012) which vary from classic design to the new very comfortable Strawberry Express. We hit Sunshine on a very good ski day. Fresh pounder had fallen and it made the hard runs much easier to ski – most runs where open to us. The resort is based around three mountains, Mount Standish, Lookout Mountain, and Goat’s Eye Mountain. You can get up to the top of these three mountains from two main areas connected via main high speed 8 passenger Gondola. The first area has 2 main lifts called the Goats and Wolverine Express. The Goats Express will get you to the top of the Goat’s Eye Mountain at around 2.500 metres. On the way down there are some brilliant diamond runs such as “Afterburner” and “Free Fall” – there are some easier blue routes down the mountain such as “Upper canyon” and “Wildfire”. If you’re a beginner or intermediate skier/snowboarder looking to brush up on your skills I would suggest heading up the new Strawberry chair which offers some nice runs down the mountain at blue and green levels. You can either ski their via the Wolverine lift, however I would suggest catching the main high speed gondola to the heart of Sunshine village. This is because if you’re a snowboarder its easy to get stuck on some flat. After you have mastered your skills on the Strawberry area, head to Lookout Mountain via the Angel Express lift. This area had the best pounder when we visited and was the most enjoyable ski area I found. There are a number of restaurants in this area offering a variety of food however it’s mostly fast food and maybe a little disappointing to European skiers used to high quality restaurants around every corner in the Alps. It’s reasonably priced and quick so you can maximise your time on the slopes. If you have come to the resort via the bus shuttle included with the lift pass you are tied to the bus timetable. So make sure you get down to the bottom of the resort bus stop a little earlier then you need to in order to get your place on the bus. They do get crowded in the afternoons and you may have to wait and hour for the next bus. 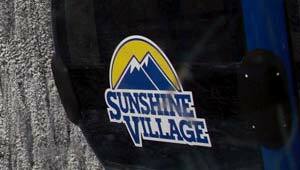 Sunshine village is a ski resort that’s grown over time. It offers tree runs as well large open areas. It’s well run, clearly laid out and with a lot of ski patrols in case there are any emergencies. It offers a good variety of slopes for all levels.